On Monday morning, our train arrived in Shanghai. Our smooth-rolling soft sleeper car was the cleanest and newest I’ve been in. The bathrooms were brassy and warmly lit; the carpets and linens had snap. 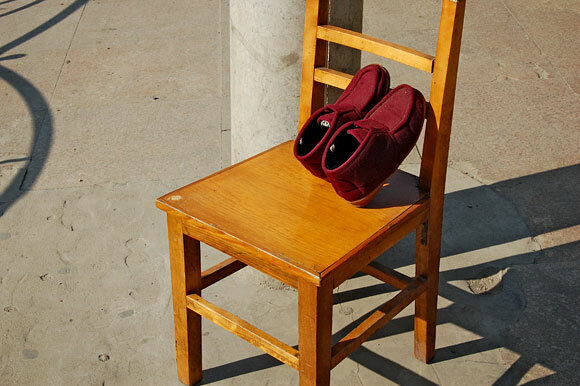 Color coded slippers were provided. Nowhere was the grime of humanity. 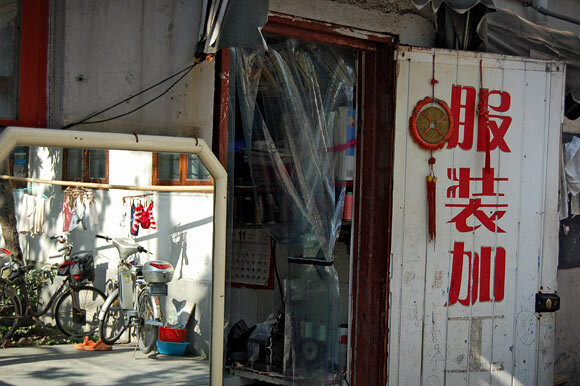 We shared our cabin with an older Chinese couple who spoke as little English as we did Mandarin. They fell asleep early and we followed suit. 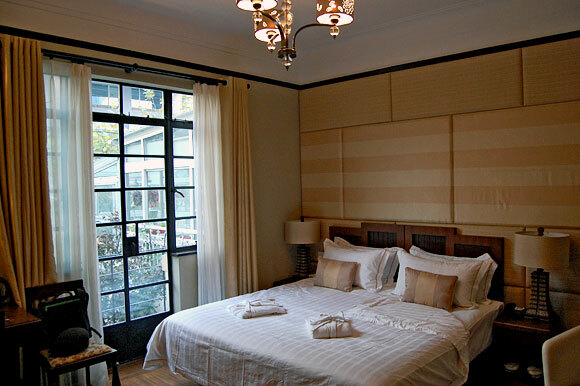 We crammed ourselves into an overstuffed subway car and headed towards our fancy-pants bed and breakfast in the French Concession. As it was early, the manager still wasn’t in, so we got breakfast before our beds in the restaurant below. The food was excelsior! “Closed Door” is by reservation only and isn’t visible from the street. There actually is a closed door with a buzzer to access the restaurant. People look at you like you’re part of the mob while you wait by the door. I rough them up. Quintet is the name, and lodging is its game. There are just 5 tastefully appointed rooms. Ours costs one month a Thai rent per night, so it’s a splurge. But whatever, I’ll just earn more money. The economy is looking good [sic] so it shouldn’t be hard. In an unrelated note, please send me money. After relaxing a bit, we headed via subway and foot to the Bund. This part of town has a lot of historical buildings and a pleasing view of the massive high-rises of the Pudong area across the river. But it also has a gross touristy feeling too. Beggar ladies, picture takers, product vendors, hucksters, gawkers, all ply this narrow stretch of park and promenade. The main road nearby was billowing dust and noise from tunnel construction. It made the whole area less romantic than it could have been. 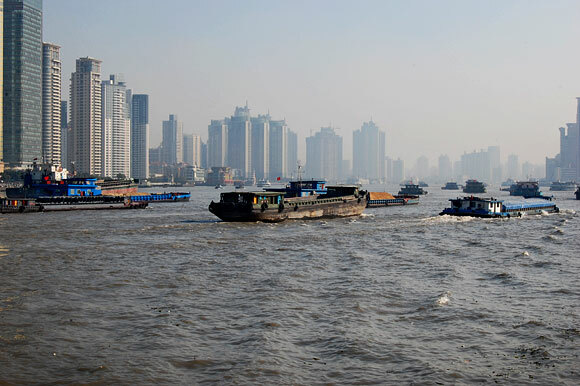 Despite the heavy haze in the air, it was amazing to see the amount of high-rises flanking the river in both directions. 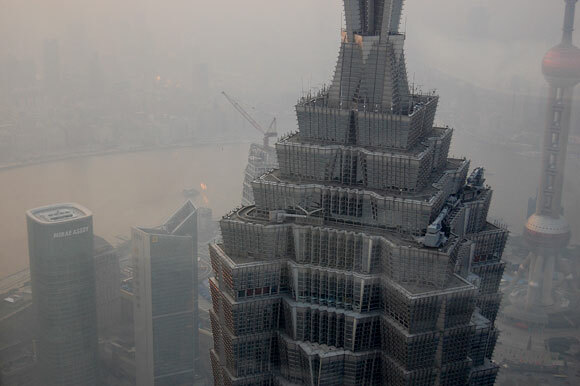 Shanghai’s air is sickening. I feel my life getting sucked away when walking around outside. I’m sure much of it is just dust from city-wide construction, but the rest is wrong. Just wrong. 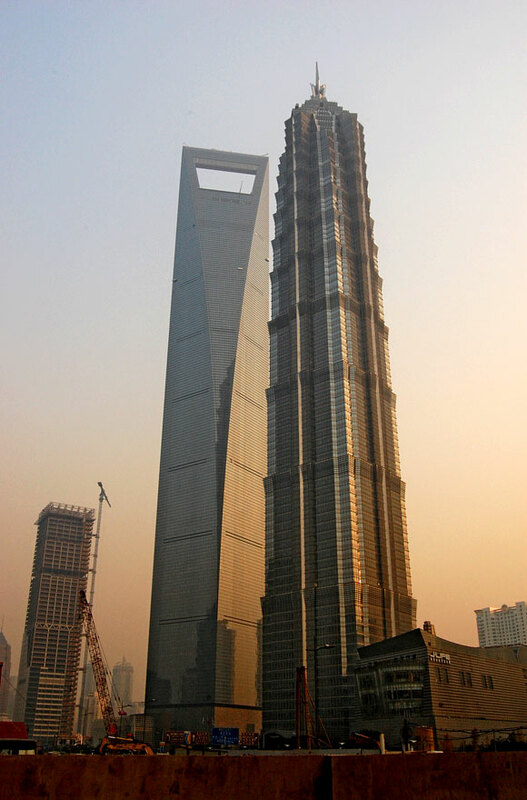 The towering and gaudy skyline of Pudong. Man posing for a picture. Many barges were speeding along the river delivering construction supplies. 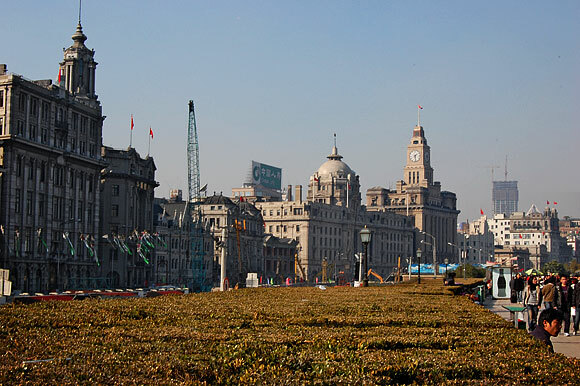 Historic buildings along the Bund. Tunnel digging for a better future. 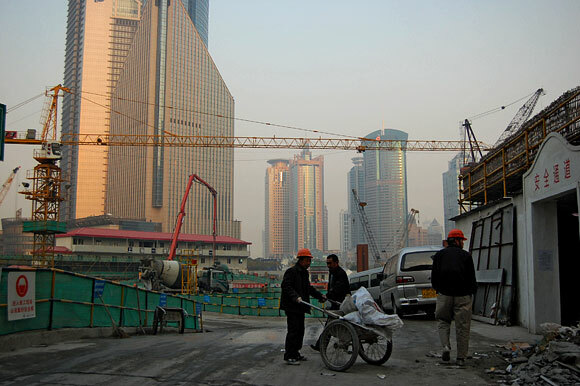 Shanghai is actually narrowing Zhongshan Road to widen the park along the river. 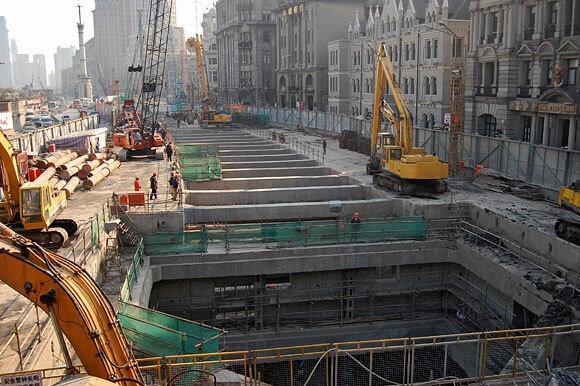 Another level of road is going subterranean. 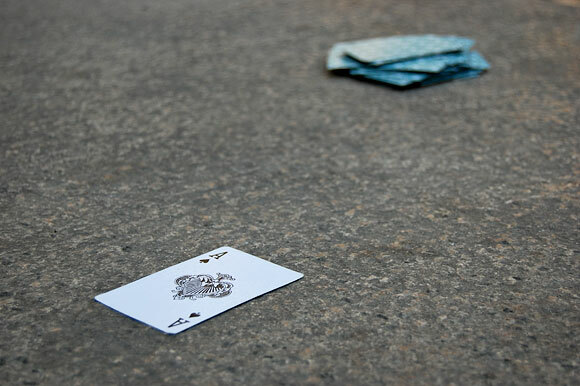 For some reason a deck of cards was left on the stoop of a building. The Ace of Spades was the only card pulled from the deck. 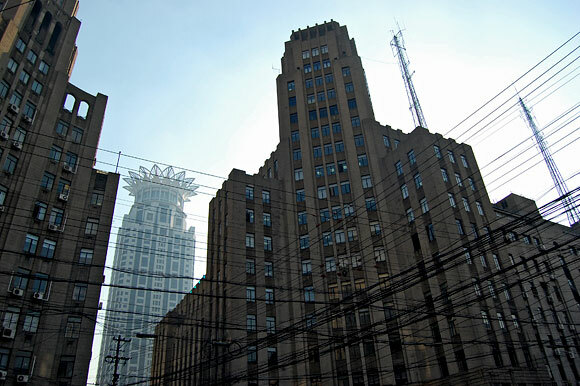 Old and new buildings, crossing power lines. 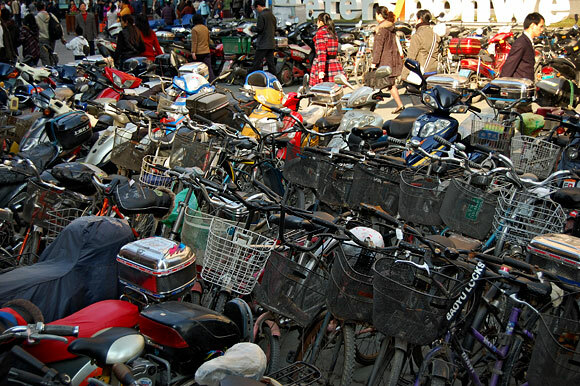 Mass of bikes and scooters parked near a subway stop on Nanjing Road. 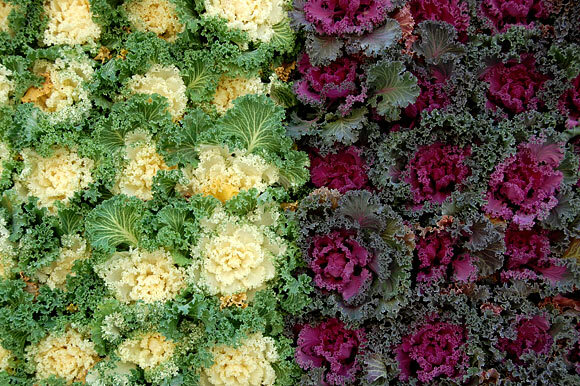 A construction wall covered with vertically growing cabbage. 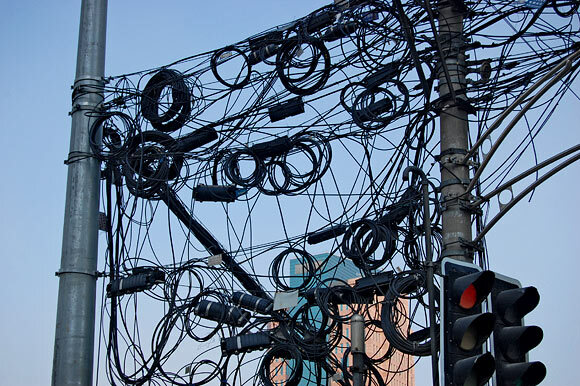 Shanghai isn’t immune from Thai style wiring. After walking around the neighborhood, we found a Sichuan restaurant for dinner. The free tea tasted like warm, oily dishrags, but our meal was pretty good. J. ordered a tofu dish. 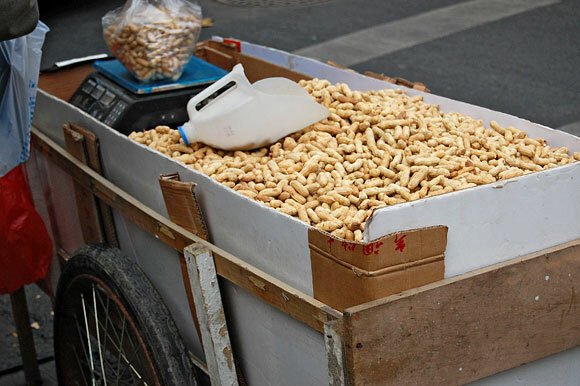 I ordered stir-fried chicken, peanuts, and chilies. The dish had a sack worth of peanuts in it, far too many to eat in a meal. I ate as many as I could, but a lot still went to waste. On the way out, I noticed the place had a sad set of tanks. 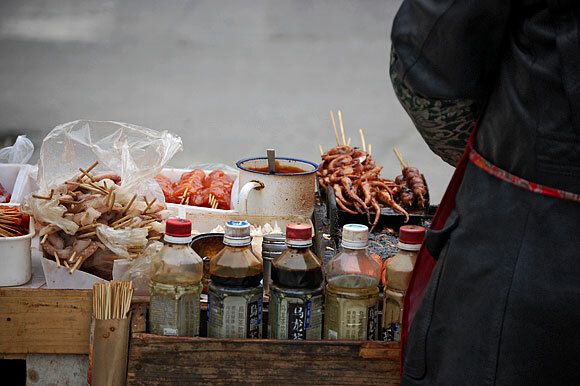 There were various types of cramped fish and crustaceans, plus a bucket of fat frogs. Maybe next time I’m feeling piggy, I’ll order the Kermit. Our second day involved a lot of waiting around. At 11, I went to meet a former coworker. 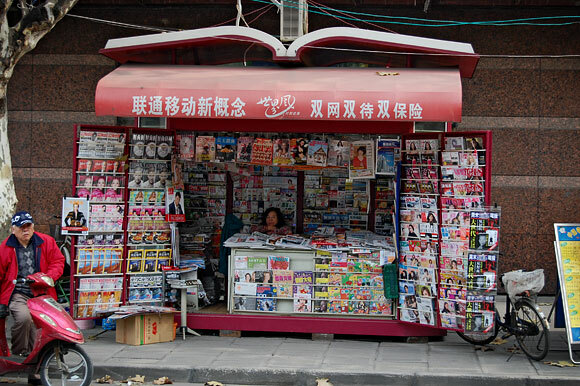 By coincidence, our hotel was within a block of the Shanghai office of the ad agency I used to work for. I was to meet with the big shot of the company, a sort of job interview. But he was swamped so I waited around before heading back to get J. so we could all go to lunch. My lunch was a plate of stir-fried beans with garlic and chilies. My friend told me to come back around 8 to meet with the boss, so J. and I went across town to pass the time. 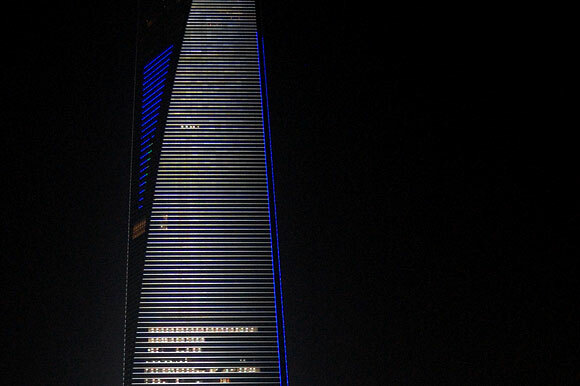 Our destination was the Shanghai World Financial Center, currently the tallest building in China. Rather than pay more than $10 each just to go to the viewing platform, we decided to get drinks at the restaurant on the 101st floor. Walking into this imposing building was impressive and even a little scary. The lobby was sparse, dark and towering. The grey suited staff were friendly but serious. They led us to a bank of elevators that only had buttons for three floors: the lobby, the hotel lobby on the 87th floor, and the restaurant on 101. As the elevator hummed hundreds of meters into the air, I felt like I’d successfully penetrated a secret base. My ears popped. Our view from the window was obscured with haze, as expected, but we got a vertigo educing look at the top of the second tallest building in China. We stayed until the sun set and the lights of the city came on. It was an expensive night of two drinks and two wonderful cappuccinos ($40), but it ended up being the same cost of just going to the viewing platform. 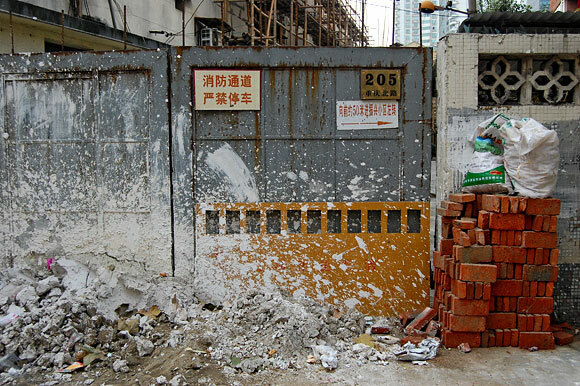 Construction lots are a common sight. 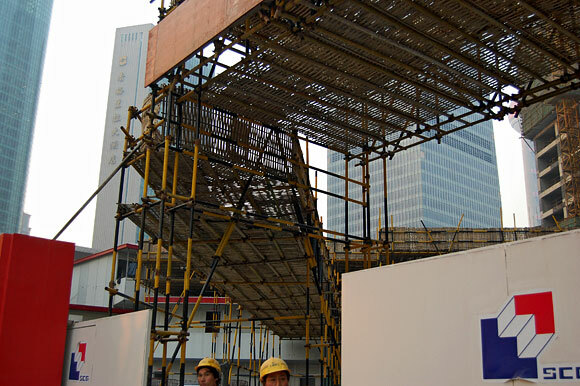 The two tallest buildings in China stand behind the ground breaking for what will be the new tallest building. The World Financial Center at night. Even though it’s generally sleek and austere, even it can’t avoid the colored lights that seem standard on buildings here. We took the subway home during evening rush hour. The tube was more packed than the colons of Home Town Buffet. 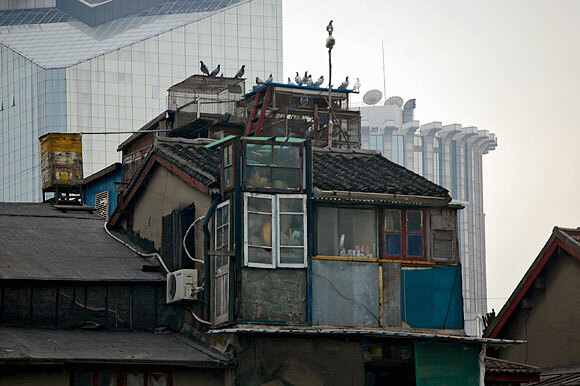 I’m not sure if I can imagine living in this city yet, but it’s an interesting possibility. For dinner we went to a dim sum restaurant. We ordered a few steamed buns, chicken in chili oil, some greens, hong kong style milk tea with balls, and massive tower of ice desert. I want to go back to get photos. Wednesday was walking day. 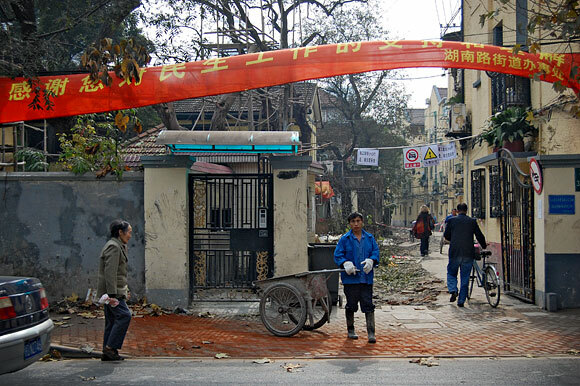 After breakfast, J. and I walked through some of the smaller streets of the French Concession, across the highway and along a massive park toward People’s Square. Plenty of fun stuff to see on the streets. 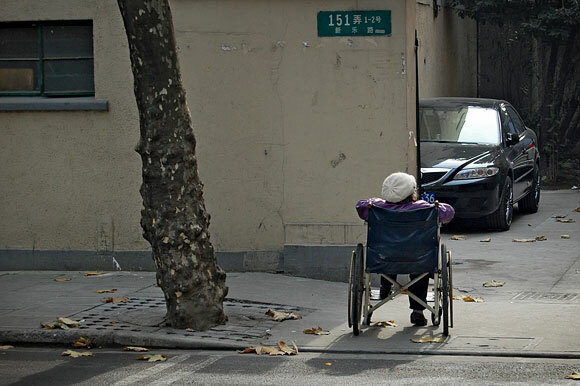 One of many old people that had been wheeled outside and left on the street. 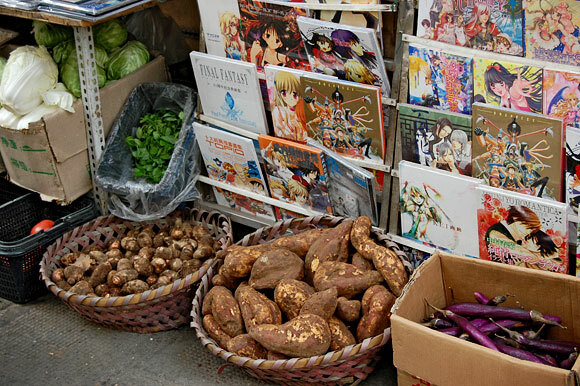 Produce and comics: a perfect combination. 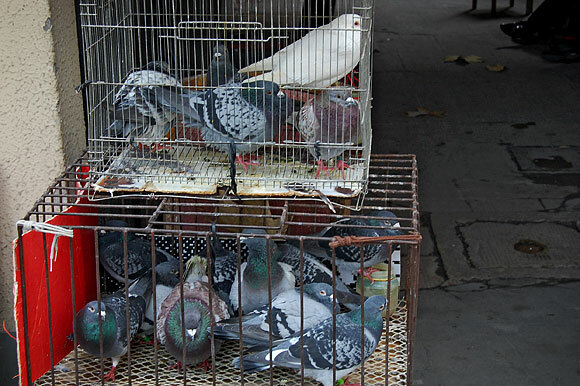 Pigeons for sale. To eat. 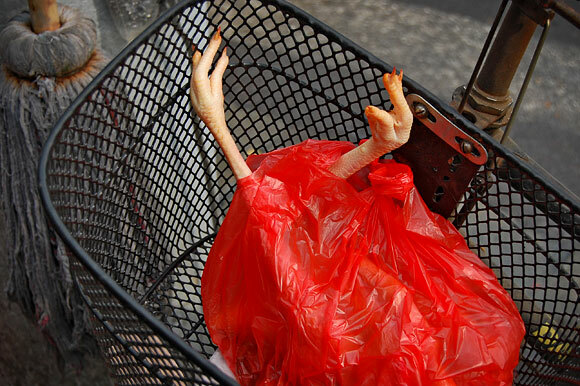 Chicken is a bag in a basket on a bike in Shanghai. Narrow alley and random people. 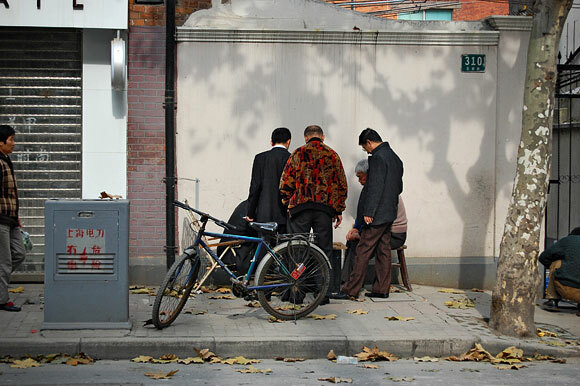 Men playing cards on the sidewalk. 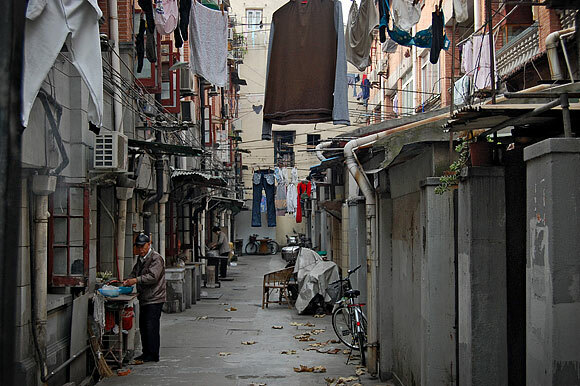 One of the dense, wonderful alleys in the French Concession neighborhood. Everyone seems to drying clothes everywhere. A porch made into a room using scrap. Who will watch those who watch if not us? 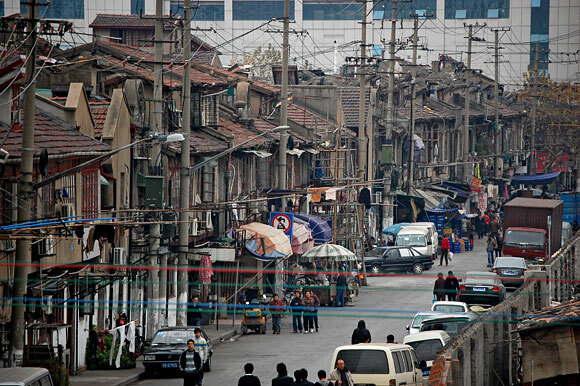 Our destination was the Shanghai Urban Planning Museum, an aging but inspiring exhibit of the city past and present. 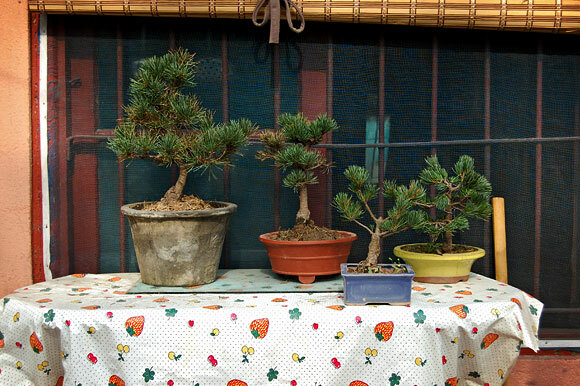 Admission was 35RMB each. The focus of the exhibit was the upcoming 2010 World Exposition. 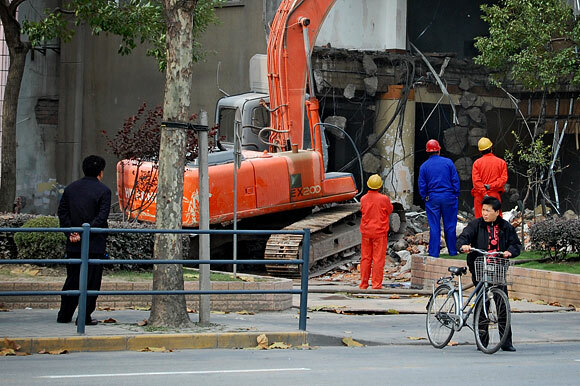 This project involves a massive construction effort all over town, and caused the demolition of a small city’s worth of buildings along the river. When all is done, that area will be amazing. 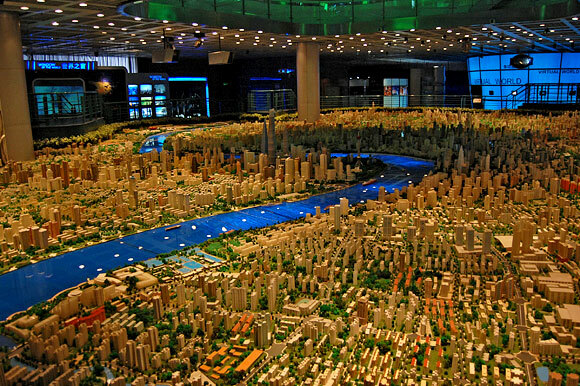 Another highlight of the museum was a room sized model of the metropolitan area of town. All of the buildings were constructed in miniature. It was insane. 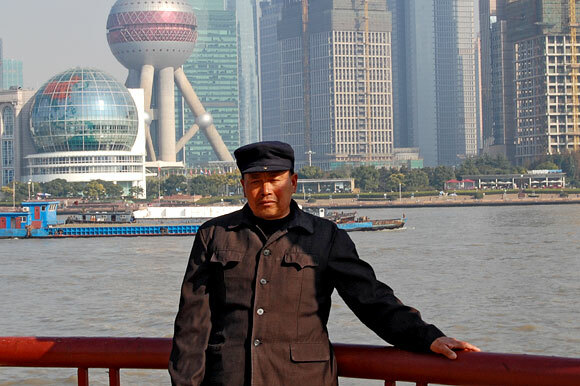 I came away from the museum feeling the might of China. There is some crazy vision and power at work over here unlike anything I’ve ever seen. 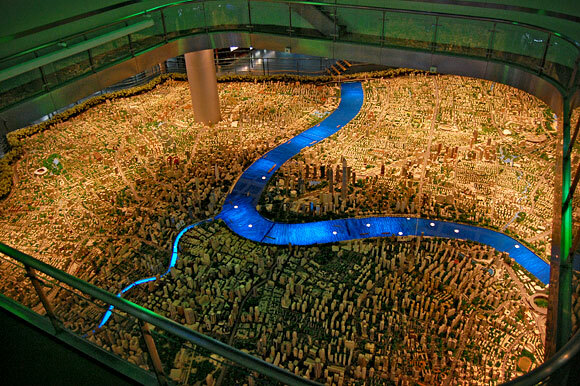 A smaller model of the city to show the plan for the exhibition. 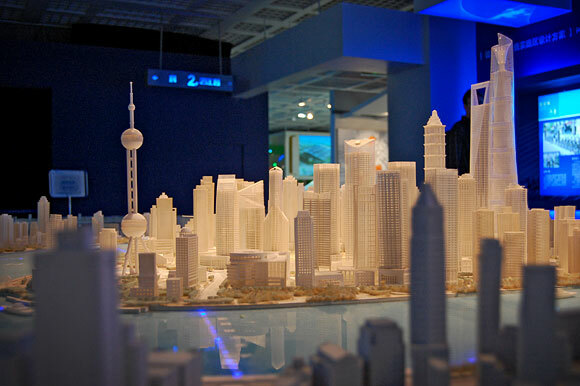 The room sized model of Shanghai. One of the things that’s mind blowing is not the sprawl of the city, but that that sprawl is of high-rises. Looking down at the model from a floor above. After the museum, we ate soup for lunch and had two specialty drinks for dessert. Mine was matcha green tea with malt on ice. J. had a chocolate drink. 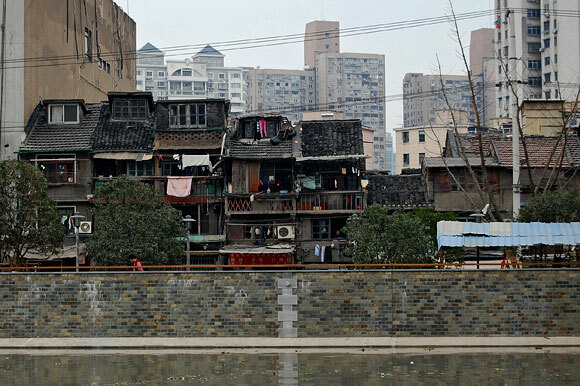 We went walking again, this time along the torn up banks of the Wusong River. This whole area is getting improvements too, so there was a lot of construction. 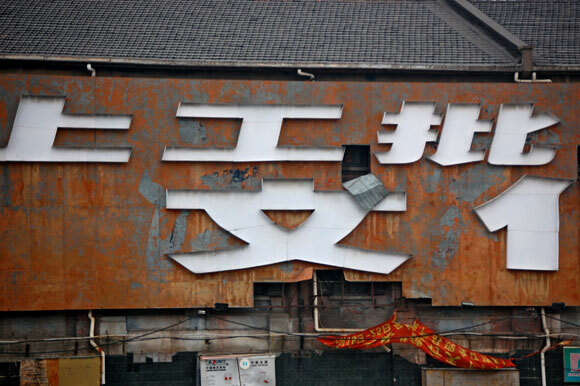 Unfortunately, a lot of the cool old buildings are getting the axe. Despite them being grimy and falling apart, it’s sad to see them go. They add a lot of visual variety to the street view. 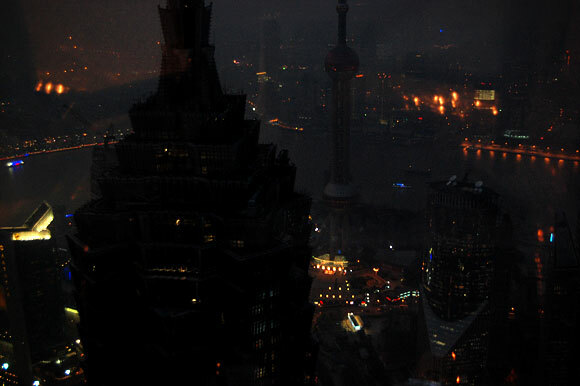 I think of them when I think of Shanghai. 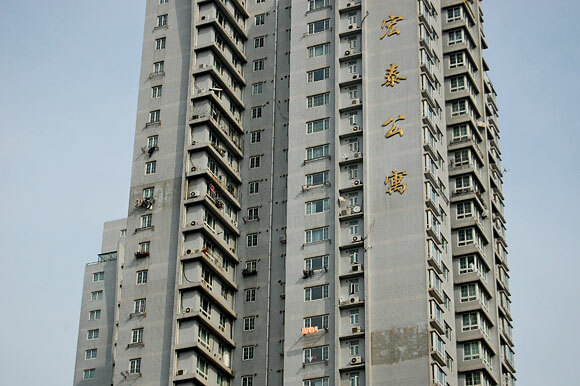 Massive residential tower with clothes drying even 50 floors up. 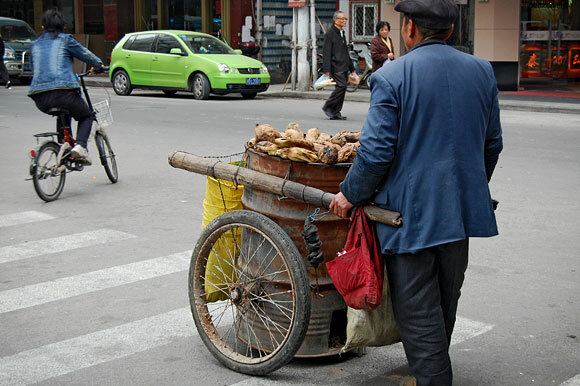 Sweet potato vendor in a suit coat. 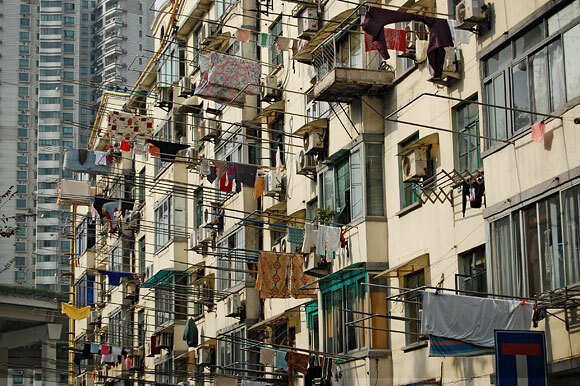 Clothes drying poles outside an apartment building. 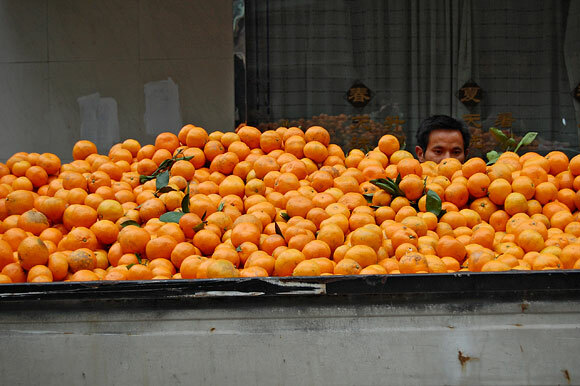 A man eyes a truck full of oranges. 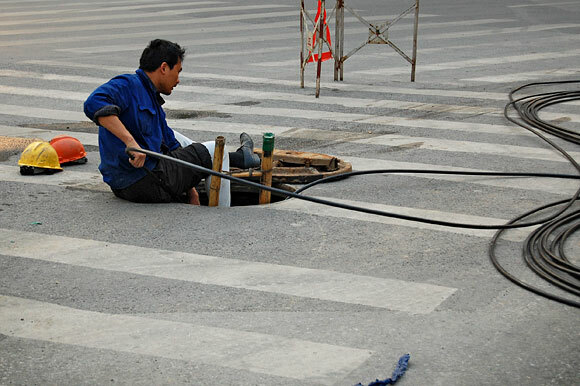 Dropping wire into the sewer. 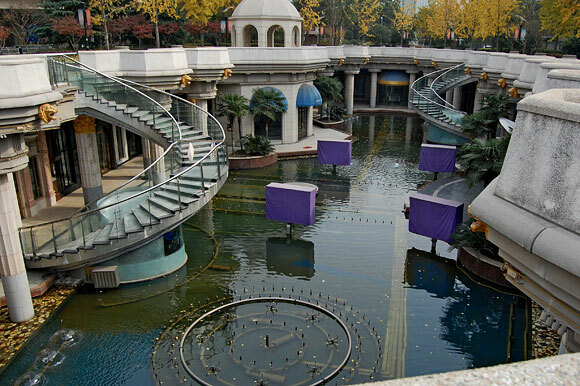 A failed subterranean shopping area in a park. 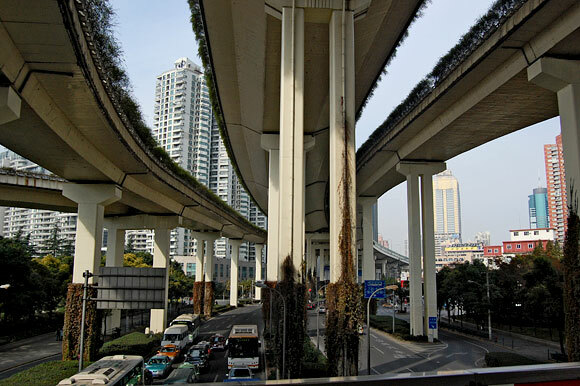 Chengdu Road overpass near Yan’an Road. Little river buildings that likely won’t survive the bulldozer. 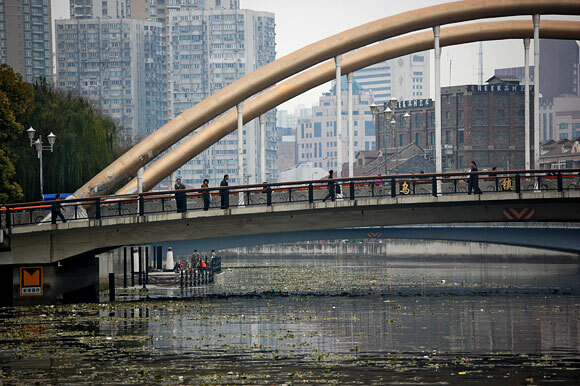 Small bridge over the Wusong. 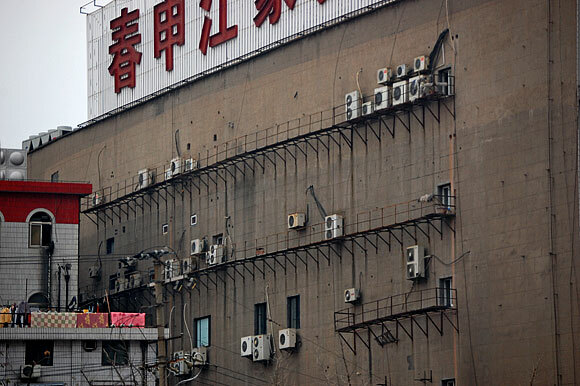 Massive wall, random air conditioners. 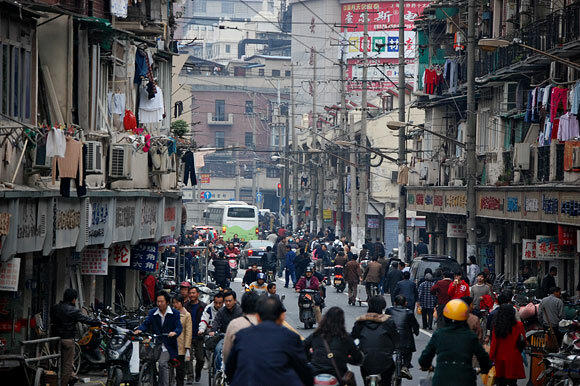 Xizang Road bustling with people and traffic. 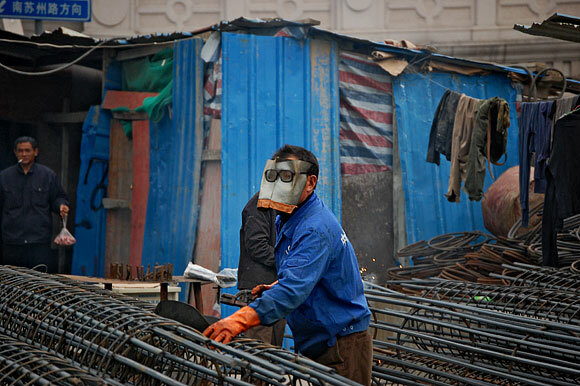 Welder and his crazy mask. Another street that might not make it. 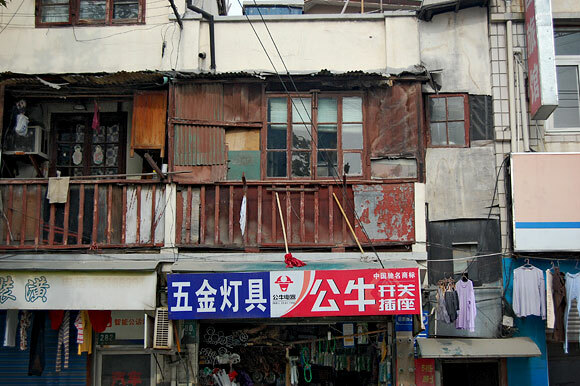 A ramshackle construction atop an apartment building. 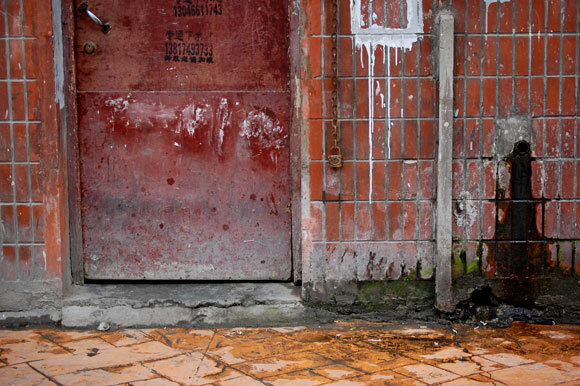 Besides a door to nowhere, it houses a few bird coops. 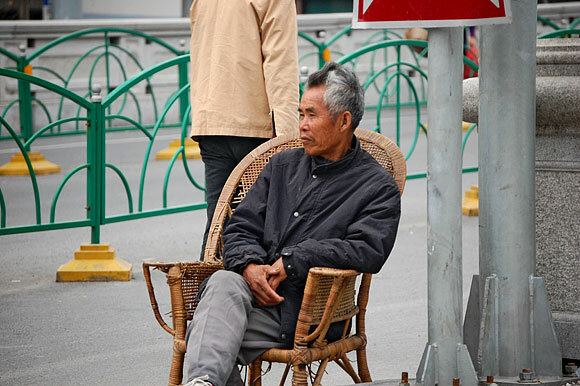 A man sitting on a wicker chair watching traffic at an intersection. 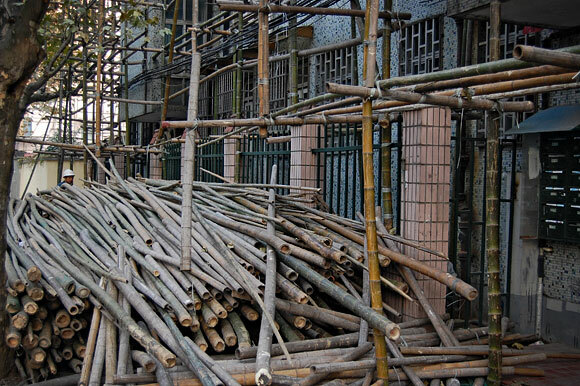 More bamboo scaffolding and walkways. This time on a high-rise scale. 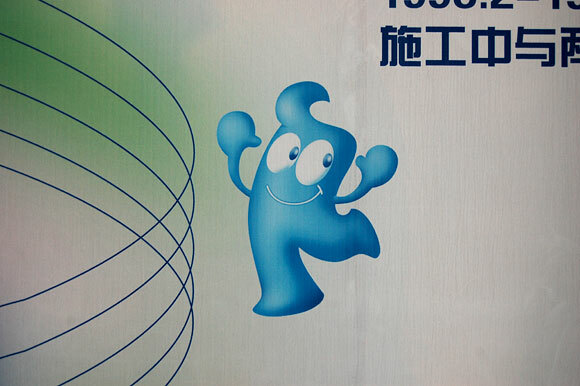 The mascot of the 2010 World Expo. It looks like he wants to sell me toothpaste too. We took the subway home and relaxed a bit. For dinner, we met a group of people at a Taiwanese restaurant near the hotel. The host couple was going to let us sleep on their couch, so we wanted to meet them in advance (and they, I’m sure, were glad to do the same). 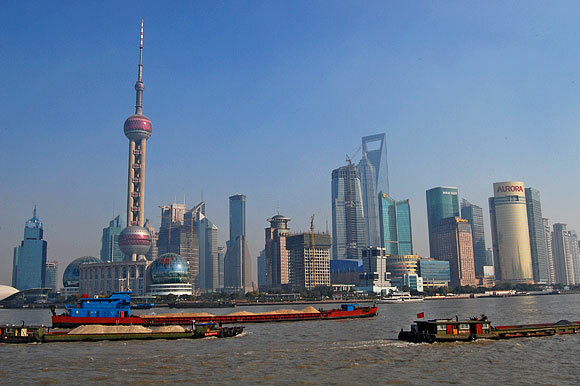 All ten people were expats from Europe working in Shanghai. It was a cosmopolitan group. The food was excellent, but the highlight was dessert. There was flan in shaved ice, mango sorbet, peanut sorbet with chopped nuts on top, and black sesame sorbet. The latter was a wet cement looking delight. I don’t know where I can get this again, and I fear I will crave it for the rest of my life. After a long day of walking and food, it was good to get back to our room. We leave for Guilin on Saturday. I’m feeling lazy, but hopefully willing to make the most of our limited time in this weird city.